ELEVATOR REPAIR SERVICE (ERS) is a New York City-based company that creates original works for live theater with an ongoing ensemble. The company’s sources range from found material (transcripts of trials, old movies, YouTube videos) to literature and conventional plays (both classical and contemporary). Founded in 1991, ERS has authored an extensive body of work that includes 19 original theatrical productions. These have earned the company a loyal following and made it one of New York’s most highly acclaimed experimental theater companies. 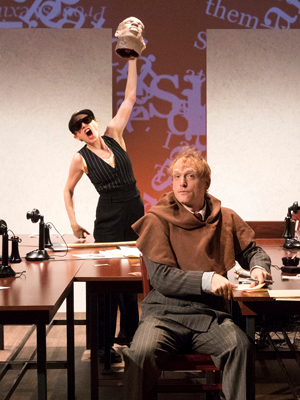 The company’s best-known work, Gatz(2006) is a word-for-word enactment of The Great Gatsby set in a mysterious low-rent office and presented in an eight-hour performance by a cast of 13. Along with The Sound and the Fury (2008) and The Select (The Sun Also Rises) (2010), Gatz forms a trilogy of work based on great American novels from the early 20th century. In 2015, ERS remounted The Sound and the Fury at the Public Theater for a successful 10-week run. Later that same year the company premiered an original stage play created in collaboration with playwright Sibyl Kempson, Fondly, Collette Richland, at New York Theatre Workshop. These productions share a commitment to risk-taking and reinvention, blending unusual texts with innovations in theatrical form. The finished works feature ERS’s signature dynamic performance style and playful sense of humor coupled with a rigorous commitment to psychologically complex performances. Fall 2017 sees the premiere of the Measure for Measure, the Elevator Repair Service co-production with the Public Theater, supported by Magic Grant from the David and Helen Gurley Brown Institute for Media Innovation. In June 2018 ERS will present a new play by longtime company member Kate Scelsa, Everyone’s Fine with Virginia Woolf, a parody of the Albee classic, at Abrons Arts Center in New York City. ERS has received numerous awards and distinctions including an OBIE for Sustained Excellence; The Foundation for Contemporary Arts Theater Grant; the Theatre Communications Group’s Peter Zeisler Memorial Award for Outstanding Achievement; Elliot Norton Awards for Outstanding Visiting Production, Outstanding Actor, and Outstanding Director; and Lucille Lortel Awards for Alternative Theatrical Experience, Outstanding Director and Outstanding Design. Artistic Director John Collins received a 2011 US Artists Fellowship, a 2010 Guggenheim Fellowship and a 2014 Doris Duke Performing Artist Award. ERS ensemble members have received OBIEs for Sound Design and Sustained Excellence in Performance and Lighting Design.